Latest Notary projects. Sacramento, California. Refinance Notary Public certified Signing Agent, signing in Sacramento, North Highlands. Spanish English certified translation of birth certificate, Zacatecas, Mexico. 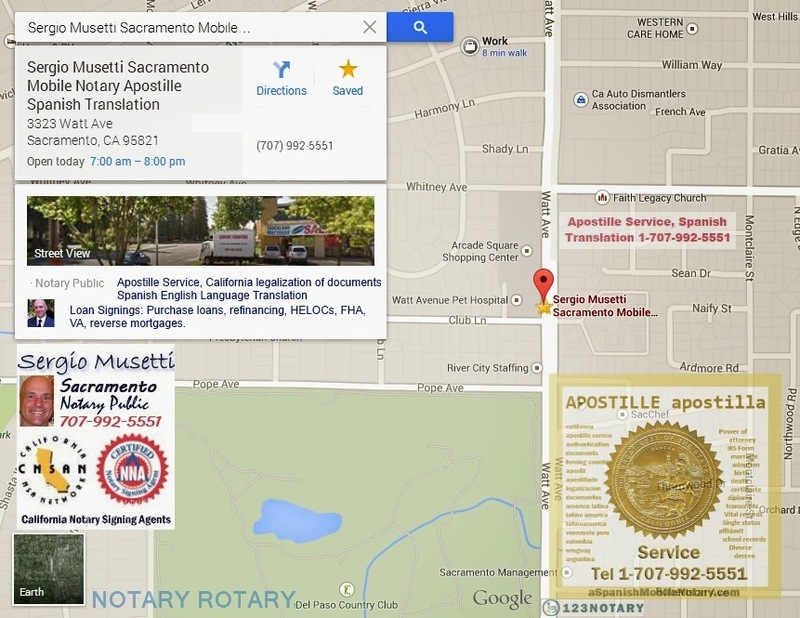 Apostille service, Spanish English translation, Sacramento Mobile Notary Public Signing Agent, loan signings, fingerprinting. Technology is changing fast and with that professionals should take advantage of it. An example of it in the mortgage industry you find SimpleNexus. They are ready to offer Mortgage applications for Loan Officers; yes, Android and iPhone apps. It seems to be a great tool for the loan industry since loan specialist(other titles or related professionals: mortgage specialist, loan consultants, mortgage advisors, home loan consultants, loan administrator managers ...) can generate more leads, connect with Realtors, and stay compliant. SimpleNexus customers collectively increased realtor connections by more than 300% in 2013. Mortgage Companies rate our customer service 9.8 out of 10. Your clients already have a calculator on their phone. Why do they need yours? This calculator has been simplified to take the guesswork out of MI. Since APR is shown on every calculation, you are also covered on compliance! Partners can send REPC's or Addendums from the field. Clients can send 1003's, Bank Statements, Taxes, W2's and more. At any time, from anywhere. Want to know who installed your app, and when they installed it? Would it be useful to know how many calculations a particular ad campaign generated? Not only will we show you, we'll send you daily activity emails! Compliance - Do you show APR? Yes. TILA Compliance requires APR to be shown on the results screen for every calculation. To enable it, just add your APR-related fees in your account settings. Once enabled, APR will be displayed for every calculation. This includes upfront and monthly MI fees as long as they apply. Compliance - Can I insert my own legal disclaimers? Absolutely. This is completely configurable, and can be updated at any any time. Compliance - Is the Equal Housing Logo displayed? All iPhones and Android phones. Between the two systems, 97% of the U.S. market is covered. How does my app get distributed? When you sign up, you will get an installation link. Send that link to clients and associates. When they tap on it, they will be directed to either the App Store or Google Play depending on what kind of phone they have. Once they install and open the app, your info is automatically populated. Do I have to hand out an "activation code"? No. Distribute the app with your installation links, and we'll take care of the rest. Can I track who is using my app? Yes. We provide live analytics to give you up-to-date information on who is using your app and when. We'll also show you what calculations were performed, and the exact numbers from those calculations. Do I actually get an app? Or is it a web page? Both the Android and iOS versions of your app are real apps. Meaning they are fast, and are real apps that get installed on your phone. Not yet. But we are collecting data to see if this is something you would like to have, so please let us know. Do my clients and realtors have to understand how MI works to get an accurate calculation? Your clients and Realtors will see what MI will cost on the calculation results screen, but they don't need to worry about how the calculation is done, or what the current rates are. Do my clients and realtors have to understand how MI works to use my app? Nope. We keep up with the latest MI Rates and Guarantee fees for FHA, USDA, and VA loans. All of these calculations are handled in the background, so your clients and Realtors can see what MI will cost on each loan, but they don't need to worry about how the calculation is done, or what the current rate is. How much branding does the Corporate Solution really offer for my company? A completely themed app is released for your company in the App Store and Google Play, a custom icon is created, and the website is themed and branded so even your LO's will feel as though it's your internally built app when they log in to view their live analytics. Emails are customized to your company, and group management is available, so an administrator can add or remove LO's at their own convenience. Can I pay for a year up front? Sure. This is an option that you can select when signing up. If you sign up, and then would like to pay for a year, just reach out and we'll take care of it. Can the calculator handle hazard insurance and taxes by a percentage? Yes. This is completely configurable from your account settings. Can I change my photo, address, and license information when I want? No problem. Just log into your account, and update your settings. Shortly after, your app will reflect the changes. I don't do Rural loans. Can I hide the USDA calculator so my clients aren't confused? Yep. Just go to your account settings page, select the Rural Calculator, and flag it as hidden. How long does it take to get my app after I sign up? Is there a limit to the number of people I can share the app with? We place no limits on the number of people who can install your app. How stable is your service? We guarantee a 99.9% uptime, and have servers in the East, Mountain, and Pacific Timezones, to ensure if there were ever a disaster, it would have to shut down the entire country to slow you down. We offer the service on a month-to-month basis. If you are dissatisfied, you are free to stop anytime. We have chosen this model because it motivates us to continue making the best product possible. In a couple of weeks EverBank will release its financial results for the fourth quarter and fiscal year ended December 31, 2013. If you are interested you can get the conference information number to listen live on Jannuary 29, 2014. EverBank Financial Corp., through its wholly-owned subsidiary EverBank, provides a diverse range of financial products and services directly to clients nationwide through multiple business channels. Headquartered inJacksonville, Florida, EverBank has $17.6 billion in assets and $13.6 billion in deposits as of September 30, 2013. With an emphasis on value, innovation and service, EverBank offers a broad selection of banking, lending and investing products to consumers and businesses nationwide. EverBank provides services to clients through the internet, over the phone, through the mail, at its Florida-based financial centers and at other business offices throughout the country. EverBank will continue to offer interest-only jumbo loans to its affluent customers, despite the litigation risk that comes with originating loans that fall outside the qualified mortgage rule. Now consumers, borrowers, will have a way to make suggestions to improve their loan closing experience. CFPB is working hard at finding ways to protect the public. The Federal Register provides and interesting checklist for borrowers as well as mortgage brokers, lenders, banks on what to report. Buying a home is often a consumer's single largest financial purchase. According to the latest numbers from the National Association of Realtors, the median price of homes purchased in the United States is now $207,000. By comparison, the median household income is about $51,000, according to the Census Bureau. It is crucial that consumers consider the numbers carefully before making this potentially long-term commitment, and closing is often their last opportunity to do so. However, closing can be stressful and confusing for consumers. The CFPB plans to conduct several initiatives in order to test and study various ways in which the closing process might be improved. This information will help inform those initiatives. 1. What are common problems or issues consumers face at closing? What parts of the closing process do consumers find confusing or overwhelming? 2. Are there specific parts of the closing process that borrowers find particularly helpful? 3. What do consumers remember about closing as related to the overall mortgage/home-buying process? What do consumers remember about closing? 4. How long does the closing process usually take? Do borrowers feel that the time at the closing table was an appropriate amount of time? Is it too long? Too short? Just right? 6. What, if anything, have you found helps consumers understand the terms of the loan? 7. What are some common errors you have seen at closing? How are these errors detected, if at all? Tell us about errors that were detected after closing. 8. What changes, diverging from what was originally presented at closing, often surprise consumers at closing? How do consumers react to changes at closing? 9. How, if at all, do consumers typically seek advice during closing? In person? By phone? Online? 10. Where and to whom do consumers turn for advice during closing? Whom do they typically trust? 11. What documents do borrowers usually remember seeing? What documents they remember signing? 12. What documents do consumers find particularly confusing? 13. What resources do borrowers use to define unfamiliar terms of the loan? 14. What, if anything, would you change about the closing process to make it a better experience for consumers? 15. What questions should consumers ask at closing? What are the most important pieces of information/documents for them to review? 16. What is the single most important question a consumer should ask at closing? 17. What is the single most important thing a consumer should do before coming to the closing table? Feedback is a great to be updated on what happens in the field. Hopefully, data will bring a good base to fine tune the process at different levels.